Solas Safe Pass Course at South Dublin, Tuesday, Thursday and Saturday, Call or Text now on 087 2404818 to book - Clayton Hotel, Sandyford. Easy access M50, exit 14. At LUAS. Secure parking. From €100pp including all fees. From City Centre take Luas green line at Stephens Green to Central Park stop. Aircoach stops at hotel door. Call now or you can text your name and your preferred date to Jim McMahon @ 087 2404818 and we will reply with confirmation. We conduct our safe pass Dublin courses in the Clayton Hotel, Leopardstown, which is conveniently located immediately off the M50 Motorway at exit 14. It is a one minute walk from LUAS green line(Central Park Stop). Aircoach from Dublin airport stops at hotel (Leopardstown coach). 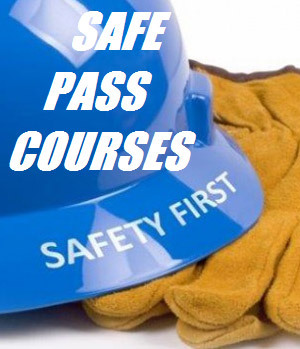 Our safe pass training courses are led by our expert trainer James McMahon. You can be confident of receiving the best training in the industry. To book, text your name and date to 087 2404818. You can email mcmahoncsm@gmail.com or use the quick online booking form below. We provide the highest standard of safe pass training courses in the industry. This course caters for people refreshing their safe pass cards, and also people seeking first time certification. This Safe Pass course meets all of the requirements you need for construction site work, to ensure that after successful completion they have the necessary knowledge of health and safety that is required. Safe Pass Registration Cards are issued for four years. After the four years the card holder must attend a Safe Pass course to update their safety awareness training. A new Safe Pass Registration Card will be issued upon successful completion of the safe pass training course. Essentially, any worker who alters, interferes or changes a building must at that time have a Safe Pass card. This requirement applies to all workers in the construction sector from the 1st of June 2003. Check The Calendar below for dates available. James McMahon - SOLAS registered Safe Pass Trainer and Chartered construction professional (ICIOB) - 30 years experience. Degree construction management & post graduate health and safety. James Mc Mahon, under McMahon CSM Ltd conducts Safe Pass Training under the SOLAS Safe Pass Programme. We conduct our training in the Clayton Hotel (formerly Bewleys), Leopardstown (near Sandyford) which is conveniently located immediately off the M50 at exit 14. It is also one minute walk from the LUAS green line, Central Park stop.